Down in the depths of small, deep pits lurk some monster carp and perch. How do you begin, when faced with a featureless hole? Small, deep pits can be natural or man-made. The natural ones are often found in rocky, boulder-strewn areas where deep fissures have flooded. Man-made ones are usually the flooded holes that remain after excavations of brick, slate, sand, gravel or any other quarrying. There’s quite a difference between these waters. Some may be simply a deep hole with no more character than a bucket; other excavations may have left a lake full of features. These can include steps, ledges, grooves and ridges, and deeper holes within holes. Finding and identifying the features should be your first job. All you need is a sliding float and a plummet. Walk around the pit, casting into as many areas as possible. In smaller pits you can plumb all areas without resorting to a boat, though it is still a time-consuming task to do properly. It is important to plumb each feature thoroughly, so that you know exactly where the water begins to deepen; where it begins to shallow again; and the exact location of any grooves or bars. At the same time, you can discover if there are any snags – such as sunken branches and rocks. Unfortunately, finding them might cost you your float and plummet, but it prevents losing the tackle and a fish later on! With so few of the pit’s natural features visible on the surface, finding out all you can about what is happening below the surface becomes very important. All the species of coarse fish normally found in still waters can be found in small, deep pits. However, the dominant species are usually carp and perch. These two generally grow to a good size where there is enough natural food to provide the necessary growth rate. Other species may not grow so large. Bream and pike, in particular, require a larger water to reach specimen size. Anglers fishing such deep waters discover a number of interesting features. One is that, except in winter, the fish are unlikely to be feeding lower than 6m (20ft) down. In the warmer months the water below this level – at about 4°C (39.2°F) – is too cold for the fish. At a depth of about 6m (20ft) there is a band of water that changes temperature rapidly. This is called the thermocline. 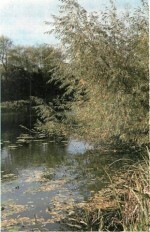 In summer the water above this band is warm – this encourages fish such as carp to head for the surface. However, in the depths of winter this upper layer may be considerably colder than the lower level – which remains at a steady 4°C (39.2°F). In small waters there is no one particular spot where fish can be found. They are usually wanderers, rooting for food in all areas. However, they still have their favourite haunts, and for many fish these are the ‘shallows’ (which may be as deep as 3m/10ft anyway) and where any weed — such as amphibious bistort – is likely to grow. The deeper water, which can be over 12m (40ft) deep in some small pits, is home to perch in particular, and to many other species in winter when the surface water has dropped below the significant 4°C (39.2°F). The lower level of water in pits -that below about 6m (20ft) – is unlikely to fall below this temperature except when a strong wind causes the water layers to tilt. When this happens the cold water is pushed on to one side and the warm water on the other. The areas with character are always worth investigating. These could be the base of a drop-off, the bottom of a groove, the peak of a bar—in fact anywhere that can grow or trap food, offer security from preda- tors, or provide an ambushing spot from which predators can hunt. On some small, deep pits carp love roving the water with their backs protruding, or at least close enough to the surface to cause bow waves. Every now and again one disappears, only for a mass of tiny bubbles to explode on the surface as the carp dives to the bottom to root for bloodworm or some other succulent morsel. The key to catching them lies in using the bait that is most obvious in deep water. At such depths sight may well be less important than smell. To catch them, use an oily bait. Try boilies soaked in fish oils, or one of the oils sold specially for boilie soaks. Tinned meatballs are another successful bait in such deep waters. These are very oily, and are best steeped in greasy gravy, perhaps mixed with a little groundbait. Use either a whole one, or half on a hook. When you throw in a few samples of meatballs – or any other very greasy bait -an oil slick forms on the surface. The bait also leaves an oily trail through the water as it sinks. It is a heart-stopping moment when you see a carp swim into an oil slick and immediately dive to follow the oily trail to its source. A useful little trick is to watch for carp approaching and cast just before they actually enter the area. This way the oil trail from the bait is at its freshest and easiest to follow. Any of the usual legering methods -such as fishing link legers or bolt rigs with hair-rigged bait — are successful.